For some time I have been using a solar spot light to illuminate the area around the entry door, using a bungee loop to secure it to the passenger side rear view mirror. Although this worked well, it didn’t provide light in the right areas when the door was open. At times the motor home was facing a direction that didn’t allow the solar panel enough exposure to the sun. Now it would be easy enough to just turn on the porch light to illuminate the area around the door. Unfortunately, that taxes the batteries. If you’re boondocking you want to minimize the draw from the batteries as much as possible. Solar lighting solves this problem because it provides light without any drain on your battery reserve. 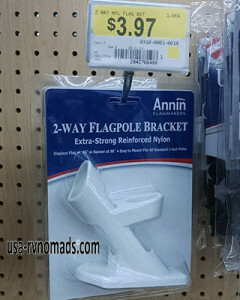 An inexpensive accessory available at Wal-Mart can do double duty…flag or spot light holder. I had given the placement and positioning of these solar spot lights consideration for months. 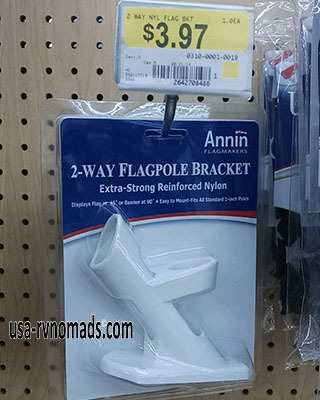 Earlier I had purchased plastic wall mounted flag pole holders, intending to mount them on the front of the rig and use them for what else – to fly our US flag. Lo and behold, I found that the post of the spot light fit perfectly into the flag pole mounts, sparking an idea to use them for the lights. But now, how could I install those mounts without drilling a bunch of holes? 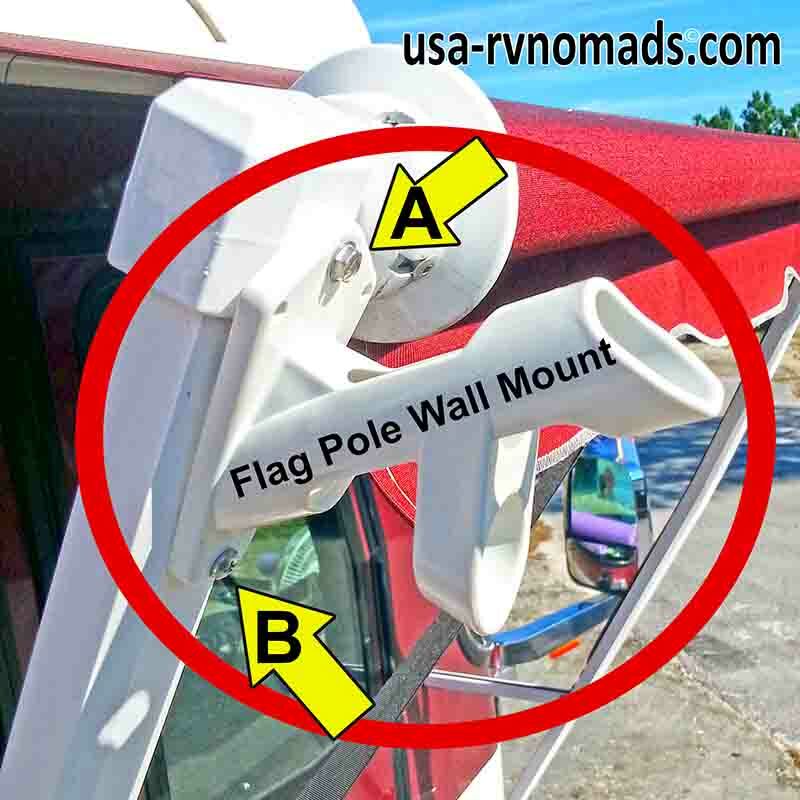 By using the existing screw (A) on the awning roller mount, only one additional hole (B) needed to be drilled to mount the flag pole (spotlight) mount. Now the spotlights are in position to provide illumination to the desired locations, are in better position to recharge in direct sunlight and can be accessed to facilitate removal/placement. 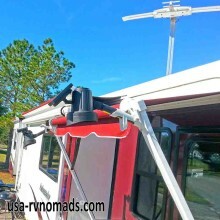 Your turn: I’m sure we’ve all found simple, inexpensive solutions like this to make life easier, or to make something function better in or around or RVs. Please share your solution in the comments … we’d love to hear about it!